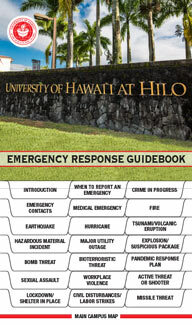 The University of Hawaiʻi at Hilo (“University”) allows individuals to bring animals on University property in accordance with federal laws and in other situations subject to therules outlined in this policy. An emotional support animal is generally not permitted on campus grounds, but is allowed to be in company with an individual in his or her University assigned residence in accordance with the U.S. Department of Housing and Urban Development. However, an emotional support animal is not allowed to accompany the individual into his or her residential dining center,or into any other University building. Animals not governed by this policy are referenced below. The University supports the use of service and emotional support animals on campus in compliance with applicable federal and state laws. At the same time, it recognizes the health and safety risks potentially created by unrestrained and untrained animals on campus. This policy sets forth roles and responsibilities of individuals bringing animals on campus. This policy applies to employees, students, University affiliates, visitors, contractors, and applicants for admission to or employment with the University. This policy should not be read to grant an individual access to University property beyond that to which they would normally be granted. animals that fall within either the classification of being an Emotional Support Animal or a Service Animal. Emotional Support Animals applies to animals living with a person with a disability in residential households. The animal can be any species of animal that provides some therapeutic benefit to person with mental or psychiatric disability, requiring no specific training. The mere presence of this animal is to mitigate the effects of the emotional or mental disability. the individual who is responsible for the care and supervision of his or her Service Animal. Terms in this policy used interchangeably with the term handler. Service Animals applies to all areas on campus (with a few exceptions) in which either a dog, or miniature horse, that has been individually trained to do work or perform tasks for the benefit of an individual with a disability, including, but not limited to, guiding individuals with impaired vision, alerting individuals with impaired hearing to intruders or sounds, providing minimal protection or rescue work, pulling a wheelchair, or fetching dropped items. Services animals are working to assist the handler and should not be considered as pets. Service Animal in Training is not considered as an animal that has been fully trained to successfully perform to work or perform tasks for the benefit of the individual with a physical, intellectual, or mental disability. As such, it will not be considered as a service animal until it has successfully completed the required service animal training. Animals are permitted on campus grounds and in some cases, into University buildings, providing the animal’s handler follows federal, state and local laws and those rules covered in this policy. Provisions for service and support animals in campus buildings are also covered below. Animals brought on campus must be under the complete control of the handler at all times and present no hazard to people or property. The wearing of a muzzle by a dog shall not be regarded as being under control by its handler. be secured to a leash, cord, chain, or similar direct physical control of a maximum length of six (6) feet, the other end of which is restrained by a person. If this constraint interferes with a service animal's work or if the individual's disability prevents using these devices the individual must maintain control of the animal through voice, signal, or other effective controls. Physical constraint of the animal does not apply to service or support animals kept within an individual’s University housing assignment. Animals must not be tethered to a stationary fixture or tree, or left unattended on campus. Service and support animals may be left unattended within the confines of the handler's university residence. be vaccinated and licensed in accordance with state and county laws. Dogs and cats brought to campus must have a valid license as evidence of current vaccinations or they may be subject to removal from campus. The University retains the right to take action to remove any animal from University premises if the safety of others, destruction of property, or disturbance warrants such removal. The removal of any animal and any necessary cleaning, repairs, and/or pest control will be done at the expense of the handler. The handler may also be subject to disciplinary action. This action may also extend to cases involving service and support animals. In all cases, the handler of the animal is responsible for the animal’s behavior. The University does not provide for the care or supervision of a Service Animal, including cleaning up after the animal. In general, animals other than service and support animals are not permitted into University buildings except animals not governed by this policy as noted. In accordance with law, the University permits service animals into campus buildings where other animals would typically not be permitted. The service animal must have been trained as a service animal in the work or tasks directly related to the person’s disability. Individuals are permitted to bring his or her service animal in all areas of the campus including University buildings and any place of public accommodation. All service animals must be housebroken, and must be under the control of the handler at all times. There are few exceptions of service animal access due to pre-existing health and safety reasons affiliated with room conditions and use; therefore, it is advised that if you are unsure, to please contact the Disability Services office for further information. Employee. While an employee is not required to submit an accommodation request to bring a service animal into a University building, he or she may seek further advice with the Equal Employment Opportunities/Affirmative Action (EEO/AA) Office on services the University can provide to employees with disabilities. Student. While a student is not required to submit an accommodation request to bring a service animal into a University building, he or she may seek further advice on services the University can provide to support students with disabilities. In accordance with federal law, the University permits an individual with a disability to keep an Emotional Support Animal within his or her University housing assignment and within restricted areas on University Housing grounds. A student must meet with the Disability Services Office and the Housing Staff when considering having an Emotional Support Animal while residing in University housing space. An individual may not bring his or her Emotional Support Animal into other University buildings, including the dining center of his or her assigned University residential facility. An emotional support animal is not allowed to accompany a University employee into his or her workplace, or any other University building, unless that building is the employee’s assigned University residence. Typically, an emotional support animal is prescribed to an individual with a disability by a Healthcare or mental health professional and is an integral part of a person’s treatment process. Individuals living in University housing will be permitted to have no more than one service or support animal. An individual may appeal the decision to the Division of Student Affairs, Dean of Students should his or her request for a service animal in housing be denied. Formal complaints regarding discrimination on basis of disability should be addressed to the EEO/AA Office. Animals involved in authorized research.